Looking for a romantic gift idea for the sweetie in your life? Or need a special date night that won’t mess with the budget? A good, at home spa date night will leave you and your sweetheart feeling relaxed, reconnected and rejuvenated. 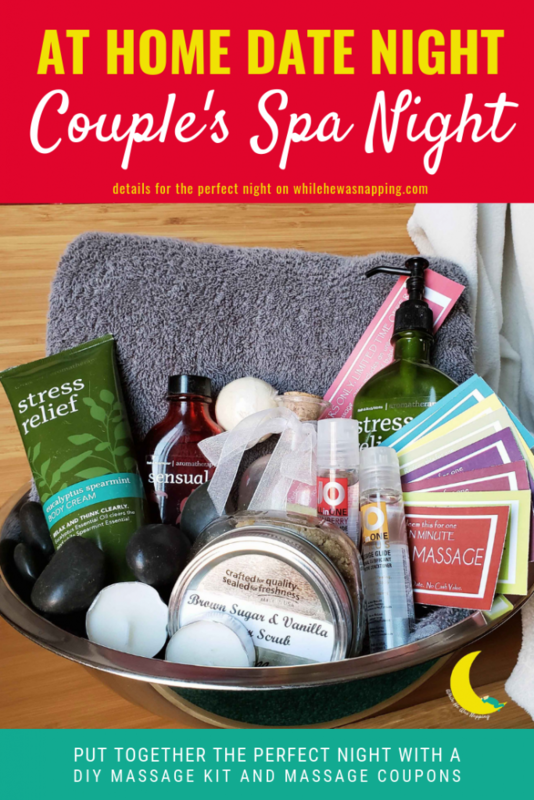 Put together a simple and super effective Massage Kit – complete with massage coupons, lotions, oils, hot stones and all good things massage – for a night you and your sweetie will enjoy! Life gets crazy sometimes, am I right? I’m a huge believer in “date night”, but I’ve honestly don’t remember the last time I went on an actual date with my husband. Between work, kids, church, chores, errands and all the other things that make up life it can be hard to fit everything in. And, if your budget is tight, it can complicate things in a whole new way. Finding a sitter for starters, right? But, reconnecting with your dream boat doesn’t have to cost a lot. And it doesn’t have to take a lot of time either! You probably have all the things you need to put together a spa date night and massage kit already. And, trust me, you’ll both be thankful for the pampering and quality time. And you don’t even have to leave home. IS A SPA DATE NIGHT WORTH IT? A spa day with lots of fancy treatments sounds nice, but the small detail of wandering around in nothing but a robe with strangers touching me gives me second thoughts. And spas are expensive. But, I can get behind doing that with, and for, my husband. Especially if it doesn’t cost a week’s paycheck. looking for a romantic gift idea for the sweetie in your life? in need of a special date night that won’t mess up the budget? wanting to reconnect with your sweetheart without leaving home? Then YES! This is the perfect date for you! Because it’s simple to organize, easy to do, it doesn’t cost a lot and you don’t need a sitter for the kids. Quality time to pamper and reconnect with your special sweetie. Who wouldn’t want that? An at home spa date night makes a great gift. 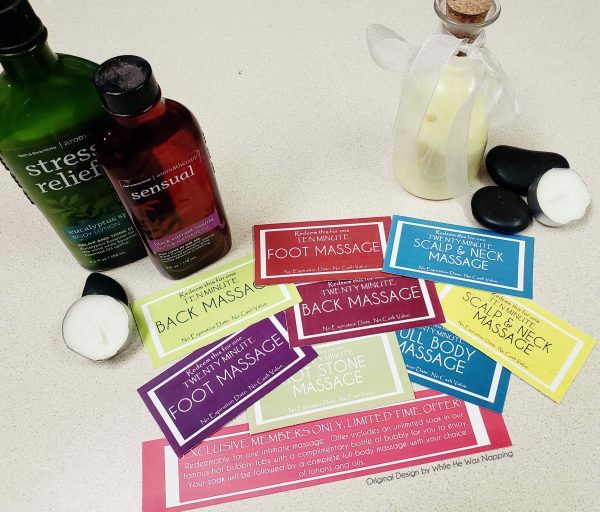 A massage kit with some great coupons (who doesn’t love to cash in a coupon?) and some massage basics are the perfect tangible gift. Pair it with a scheduled night to get to use those coupons and the goodies in the kit, and you’ve got a romantic gift you’ll both look forward to using! Whether you decide to give the spa kit and massage coupons as a gift and do the date night later or whether you choose to plan a whole special spa date night, just remember to focus on your sweetheart. Relax, reconnect and rejuvenate each other because that’s what this whole thing is about! Massage Coupons your sweetie will love. You can grab the coupons I used in my massage kit from my Etsy shop. There’s even an editable PDF file you can use to create your own coupons super easy. Smooth stones. You can get a small bag of decorative stones at Dollar Tree and they work great so grab a bag of those next time you’re there! Rice bag or heating pad to warm up your stones or relax tense muscles. Massage tools – this is totally optional and definitely not a must-have for a successful evening. stash and see what you can use that you already have because free is the best price, right? But, if you need to make any purchases, now is the time to do it. Just remember, simplicity is good too. This is all about your time together! 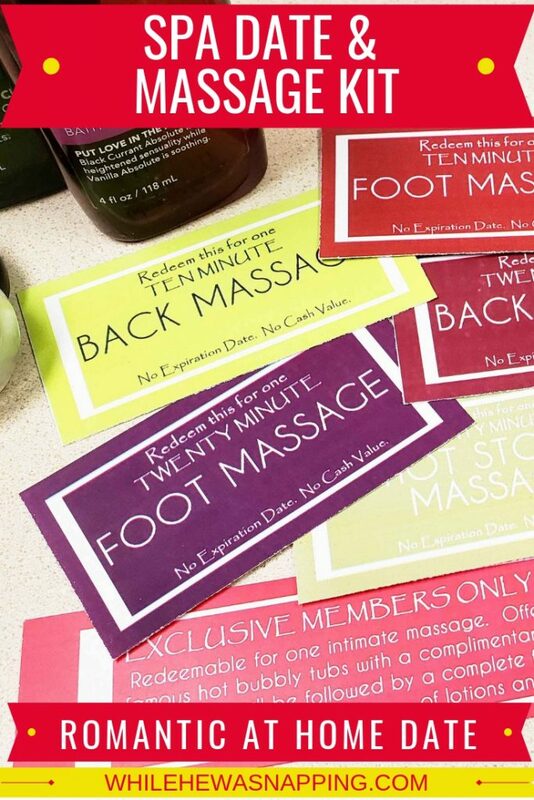 Step #2 – Make your massage coupons. While you definitely don’t HAVE to include any coupons, it would be fun to know that this isn’t necessarily a one-time deal. My husband and I have a deal that once one of us redeems the coupon I used Photoshop but you can make them with whatever you’d like. Open your favorite word processing program, image editing software or go old-school and grab some paper and pens. If you don’t want to bother with making your own, don’t forget you can get a copy of the massage coupons I designed in my Etsy Shop, along with the editable PDF file that will let you design your own really quick. 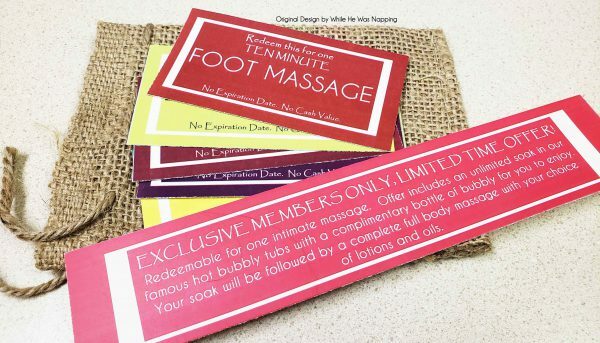 I also included an “exclusive members” coupon that pulls out all the big spa-like treatments. Hot soak in a bubble bath with bubbly beverage, full body massage with lotions and oils, facial, his choice of other massage technique. Something super special for after a rough day… or week. YOUR SPA DATE NIGHT KIT IS ALMOST READY TO GO! 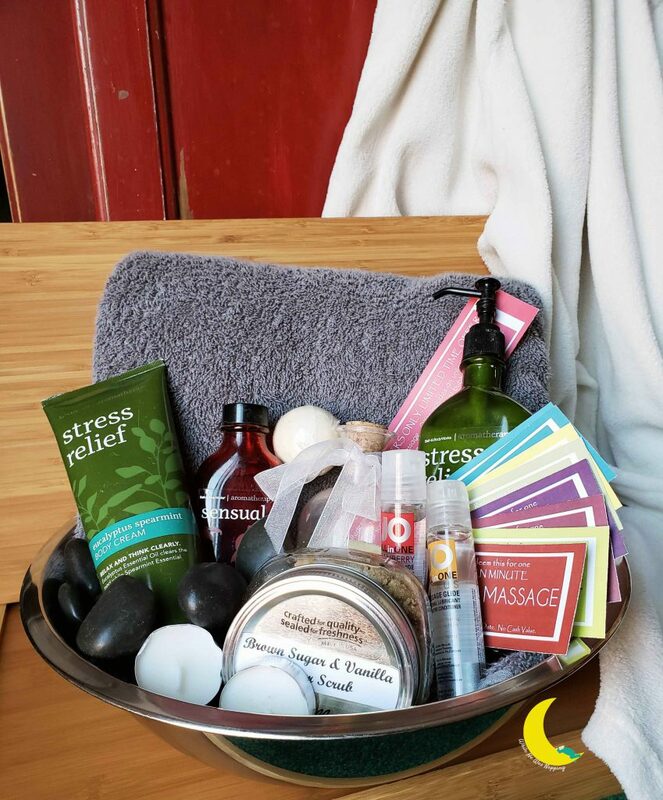 Step #3 – Gather your massage goodies and put them in a basket or other container so everything is together and neat. If you’re going to give them as a gift, you can dress them up fancy with a bow. If you’re going to use them as a date night, you can just use the basket so everything is in one place. Cue up your music, put your bubbly beverage on ice (or in the fridge) and let the romancin’ begin! Remember, it doesn’t have to be a crazy grand gesture that takes a lot of time and planning and supplies. Your at home spa date night should be about reconnecting with your dream boat so . Keep it simple. Make sure you reciprocate equally. And enjoy each other. Relax. Reconnect. Rejuvenate. And you don’t even have to leave home. CHECK OUT MORE DATE NIGHT IDEAS TO KEEP THE ROMANCE ALIVE, EVEN WHEN LIFE GETS CRAZY! Thanks! I’ve been looking for homemade gifts for Mr. F! Very nice – I’m sure it will be appreciated.